The military construction project features a hospital complex with 120 in-patient beds, primary and speciality care clinics and 3,500 parking spaces. U.S. Army spokeswoman Jennifer Albert said: "There’s been a lot of hard work and planning... to make it (Fort Belvoir Community Hospital) a world-class facility". The project is located in Fairfax County, Virginia, a suburb of Washington, D.C., and "will serve as an exemplary model for treating wounded soldiers". 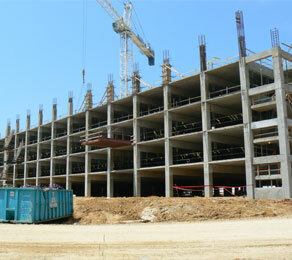 The U.S. Army Corps of Engineers used a combined ‘design-bid-build’ process for the hospital, which accelerated the design and construction phases whilst controlling cost and schedule. CCL was contracted to furnish the post-tensioning material for the two parking structures, serving the new hospital and totalling about one million sq ft (304.8k m2) of floor-slab area. The project is being delivered under a design-build programme with Oncore Construction. Desman Associates, one of the leading parking structure consultants in the US, is serving as the engineer of record on the project. The project has typical bays of 60" x 18" with 15" x 36" beams, and a one-way 5⅟2" slab. The CCL project management team worked closely with the contractor Oncore Construction to keep the project moving at a fast pace whilst satisfying all the requirements of the US Army Corps of Engineers, which accepts nothing less than the highest quality of workmanship and material on its projects.